The Best Nephrology blogs from thousands of top Nephrology blogs in our index using search and social metrics. Data will be refreshed once a week. About Blog The Renal Fellow Network (RFN) was established on April 23rd, 2008 by the late Nathan Hellman. RFN was created to provide a forum to discuss interesting nephrology cases, scientific papers, and other topics germane to nephrologists, particularly fellows. Facebook fans 3,166. Twitter followers 6,744. About Blog NephJC is a nephrology journal club that uses Twitter to discuss the research, guidelines, and editorials that are driving nephrology. We discuss the most important articles influencing the science and practice of nephrology. Facebook fans 367. Twitter followers 6,750. About Blog Medical education site for health professionals in the field of kidney disease, especially dialysis, treatment of hypertension, and clinical nephrology. New York About Blog Nephron Power is an academic blog that focuses on one main objective- Nephrology Education. It showcases several features like news,Consult rounds, topic discussions, concept maps, clinical quizzes and announcements of conferences and new blog and teaching sites. London About Blog Find the latest research, reviews and news about Nephrology from across all of the Nature journals. Facebook fans 718,931. Twitter followers 1,145,833. AZ. About Blog Early Stage Chronic Kidney Disease explains to the newly diagnosed CKD patient and others the medical terms and information, and the overwhelming task of trying to understand all this at once. It covers the initial suspicion of the disease and the necessary tests to verify that suspicion. Facebook fans 350. Twitter followers 416. Washington DC About Blog Updates about Nephrology from MDlinx.com . MDLinx connects healthcare professionals and patients to tomorrow's important medical news, while providing the pharmaceutical and healthcare industries with highly targeted interactive marketing, education, content, and medical research solutions. Facebook fans 4,016. Twitter followers 11,350. Boston, MA About Blog The nephrology hub contains articles on UTI, chronic kidney disease, kidney transplantation, and pyelonephritis. Facebook fans 1,567,757. Twitter followers 465,812. UK About Blog Kidney Research UK is the leading UK charity funding research that focuses on the prevention, treatment and management of kidney disease. Kidney Research UK also dedicates its work to improving patient care and raising awareness of kidney disease. Facebook fans 20,775. Twitter followers 43,183. Seattle About Blog Tracking industry news and trends, in advocacy, reimbursement, politics and the provision of dialysis! New York, NY About Blog Latest urology and nephrology news, research and treatment articles for urologists and nephrologists to stay updated. Clinical reviews on renal and urology treatments. Facebook fans 5,903. Twitter followers 9,497. Philadelphia, PA About Blog AJKD, the official journal of the National Kidney Foundation, is recognized worldwide as a leading source of information devoted to clinical nephrology practice and clinical research. Facebook fans 10,156. Twitter followers 7,836. Washington, DC About Blog American Society of Nephrology leads the fight against kidney disease by educating health professionals, advancing research, and advocating the highest quality care for patients. Facebook fans 28,445. Twitter followers 13,928. About Blog ASN leads the fight against kidney disease by educating health professionals, advancing research, and advocating the highest quality care for patients. Facebook fans 28,423. Twitter followers 3,552. Bethesda, MD About Blog The American Journal of Physiology-Renal Physiology publishes original manuscripts on timely topics in both basic science and clinical research. Published articles address a broad range of subjects relating to the kidney and urinary tract, and may involve human or animal models, individual cell types, and isolated membrane systems. Facebook fans 131. Twitter followers 746. Facebook fans 267,414. Twitter followers 11,846. About Blog The Journal is the official publication of the African Association of Nephrology, the organisation representing the professional interests of African clinicians and researchers in the discipline of nephrology. United Kingdom & Europe About Blog The European Medical Journal is a specialist publisher who combines leading editorials from key opinion leaders with a concise news coverage from the leading congresses within the industry, delivering world-class insights to the key developments and advancements within both clinical and pharmaceutical areas. Facebook fans n/a. Twitter followers 3,922. About Blog KI is peer-reviewed and publishes original research in both basic science and clinical medicine. These include the latest clinical studies on emerging developments in renal medicine and the highest level of original research studies in therapy and epidemiology of acute and chronic kidney failure, as well as their translational aspects and genetic basis. Madison, WI About Blog Home Dialysis Central is a one-stop, online source of up-to-date, unbiased information about home dialysis—in all its forms—for people with kidney disease, their families, and the healthcare professionals who provide kidney disease care. Facebook fans 859. Twitter followers n/a. About Blog The Journal of Renal Nutrition is devoted exclusively to renal nutrition science and renal dietetics. Its content is appropriate for nutritionists, physicians and researchers working in nephrology. New York About Blog Advances in Chronic Kidney Disease presents focused review articles devoted to a single topic of current importance in clinical nephrology and related fields. The in-depth scholarly review articles explore the care and management of persons with early kidney disease and kidney failure, as well as those at risk for kidney disease. Facebook fans n/a. Twitter followers 23,067. INDIA About Blog It is a peer-reviewed, journal that publishes articles covering all the aspects of laboratory and clinical nephrology. It includes original researches, reviews, editorials, technical notes, symposia proceedings, and Society news. About Blog I am a board certified clinical nephrologist in Detroit. I am a partner at St Clair Nephrology. I am an Assistant Clinical Professor at Oakland University William Beaumont School of Medicine and part of the faculty for The St John Hospital and Medical Center Nephrology Fellowship. Facebook fans 512. Twitter followers n/a. 25. Demystifying Kidney Disease for the Average Joe! FL About Blog Hi! I try to be an empathetic listener to my patients' trials and travails. I consider myself a part time kidney doctor, and a full time dad. I practice Nephrology! California, USA About Blog The Chronically Happy Blog features personal stories and first-hand experiences of people living with chronic kidney disease and their families. Facebook fans n/a. Twitter followers 5,175. About Blog The journal promotes basic research, clinical practice through education and dissemination of knowledge in the field of nephrology and andrology in the specialties of integrative medicine and the allied interdisciplinary subjects. Jalandhar, India About Blog Kundan Kidney Care Centre is committed to Ayurvedic medical principles in partnership with modern medical care. By providing an herbal system of treatment uniquely tailored to a patient’s level of kidney disease, we seek to give each person a renewed health and a fresh start in life. About Blog Our mission is to bring evidence and experience based nephrology education to a global audience. Facebook fans n/a. Twitter followers 269. St. Petersburg, Florida About Blog St Pete Urology has extensive experience in the diagnosis and treatment of urological diseases and conditions. Facebook fans 147. Twitter followers 592. About Blog Welcome to Kidney Connect - a place where people living with - and affected by - kidney disease get connected. About Blog The KCCure blog covers kidney cancer research news and stories about renal cell carcinoma clinical trials and treatments to cure kidney cancer. Facebook fans 1,735. Twitter followers 420. 33. A new hope for kidney patients! About Blog Welcome to my blog! My name is Michael Wright. In this blog I'll talk mainly about kidney disease and how a patient can cope with it. Camberwell, Australia About Blog I'm a 64-year old guy with zero kidneys. I have worked​ at my own business for 23 years as a technical writer, knowledge and business process management consultant. I've had two transplants, and I recently returned to the BigD when my last transplant failed in November 2008. UK About Blog KCSN is largest and most active patient-led kidney cancer charity. Its the right place to find support and information, and to be part of a caring and knowledgeable community of people. Facebook fans 1,049. Twitter followers 594. Global, based in Amsterdam About Blog IKCC is an independent and democratic network of patient support and advocacy organisations established with the mission of improving the quality of life of patients and their families living with kidney cancer. IKCC provides information, support and assistance to national kidney cancer organisations. Facebook fans 8,928. Twitter followers 2,746. About Blog Reliant Renal Care is devoted to keeping our viewers up to date on the most recent news, information & developments in kidney dialysis. About Blog PREPARE NOW is a study that puts patients at the center of kidney care. About Blog Hi. I'm Steve - you've found my blog. I talk about my experiences with dialysis and transplants all while trying to live a "normal" life. A young man's view - tinged with humor. Santa Barbara, CA About Blog Inspiring real life stories of love, bravery, compassion and selflessness. Highlighting those who are living with kidney failure, living kidney donors, family members of patients and those in the medical field. Facebook fans 1,279. Twitter followers 44. South Texas About Blog At South Texas Renal Care Group, we are dedicated to improving the health and well-being of kidney disease patients throughout San Antonio and South Texas. We provide comprehensive treatment for hypertension, diabetic and non-diabetic kidney disease, and renal transplantation services. Facebook fans 175. Twitter followers 20. About Blog Just a young girl, learning to deal with her kidney failure! UK About Blog The Renal Association is the professional body for United Kingdom nephrologists (renal physicians, or kidney doctors) and renal scientists in the UK. From its foundation in 1950, the Renal Association has been active in promoting and disseminating research that may ultimately improve outcomes for patients with kidney disease. Facebook fans n/a. Twitter followers 3,440. About Blog With ever increasing number of scientific publications, we, clinicians, struggle to make sense of the research. Only a fraction of published research will ever actually help change the way our patients ‘feel-function-survive’. We are trying to think aloud on the published evidence, and no way claim to be the final word which probably doesn’t exist in science. About Blog The history of nephrology dialysis and transplantation in random bite-sized chunks! Chicago About Blog Nephrology News & Issues covers the latest developments in nephrology and is an online resource for dialysis and transplant professionals. Facebook fans 11,828. Twitter followers 3,209. Oakland, CA About Blog Bringing you my expertise and unique experiences as kidney doctor (nephrologist), former primary care doctor, patient (kidney donor), and someone who loves somebody living with kidney failure, through storytelling. Facebook fans 129. Twitter followers 689. About Blog Chronicling my life with chronic kidney disease, from diagnosis to donor search, dialysis, transplant and beyond. About Blog Follow a mom and a child with nephronophthisis through the kidney failure and transplantation process. About Blog Theodore was born with renal failure. This is his story. Facebook fans 1,042. Twitter followers n/a. United Kingdom About Blog News on kidney dialysis and renal failure in general. Relevant info on research, problems caused by medications, improvements in treatments. Cardiff, Wales About Blog Dan shares tips and information on dialysis who is suffering from chronic kidney failure and dialysis! Facebook fans n/a. Twitter followers 189. Lambourn UK, now Swindon UK About Blog Donate a Kidney. Evaluation process to become a Living Kidney Donor. Facebook fans n/a. Twitter followers 242. Stockholm, Sweden About Blog A Nightmare Realized is blog about Mary Stewart's Kidney disease and cancer treatment. Jupiter, FL About Blog Dr. Abbas Rabiei gives information on nephrology, dialysis andinternal medicine. Facebook fans 6. Twitter followers 12. About Blog Alysia is a kidney recipient, who tells the story of first kidney transplant and need for second kidney transplant. San Francisco, CA About Blog Reddit is a community of millions of users engaging in the creation of content and the sharing of conversation across tens of thousands of topics. Facebook fans 1,165,235. Twitter followers 523,757. 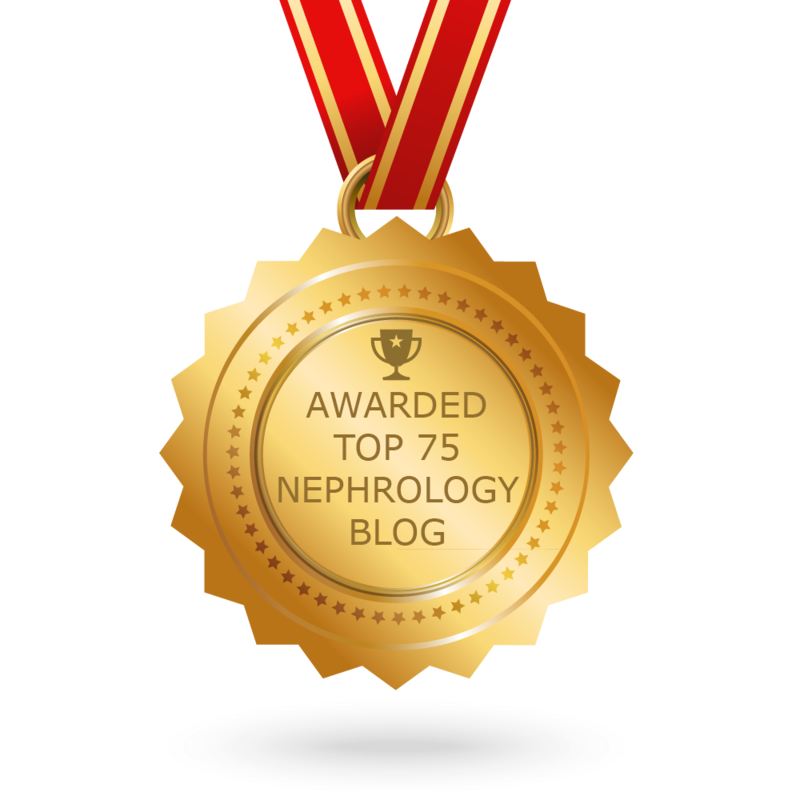 CONGRATULATIONS to every blogger that has made this Top Nephrology Blogs list! This is the most comprehensive list of best Nephrology blogs on the internet and I’m honoured to have you as part of this! I personally give you a high-five and want to thank you for your contribution to this world.